This morning on the way into work, I was hustling up Park Ave north of Lake Street but South of 26th Street. I got caught at the light on 26th (I never seem to make that one) and while I am waiting for the light, a tall guy on an upright bike of some sort rolls up behind me. The light changes and I pull away from the intersection and quickly get up to about 18.5 mph, which for me is pretty fast. At least, I thought so. A block later, the guy on the three speed or whatever essentially wrinkles time as he passes me going about 21 mph. And what really got my attention was that and he looked like he's not even working. He's just... toodling along... in a light jacket and some slacks. I would have gotten a picture but there was no time. He dropped me like a bad habit and I lost all chance of catching him when he made the light at Franklin and I did not. Oh well, it's more about the ride. That's what said a few weeks ago, so it must be true. "The eulogy for Walter Cronkite as "the most trusted man in America" on the CBS "Sixty Minutes" show said a lot about the condition of this nation -- though it did not signify what CBS thought it did. It wasn't about the death of one hugely esteemed individual; it was about the broad institutional failure of TV news in general and the current grievous loss of legitimacy and authority in shaping a national consensus of reality." I agree. I have all but stopped reading the Star Tribune and listening to NPR these days. The Strib's gutting of the news department and their columnists has left the paper a hollow shell of what it used to be. As for NPR, the meticulously cultivated sincerity of the announcers gives me the hollowing fantods (thank you, DFW). There's almost nothing more irritating than that "NPR stutter" as Neal Conan or Steve Inskeep (sp?) pretend to wrestle with the pretend weighty issues they are informing us about (even if it's something as insipid as a guy who found a wedding ring in a fish he caught). The nomination of Sotomayor was an NPR hat-trick - what could be more toothsome to them than a story with a Barrack Obama/Supreme court/Latina angle? The coverage was relentless. There's a lessor know movie by Mike Judge (Beavis and Butthead) called Idiocracy that foreshadows where we might all be headed if this trend continues. In the movie, all the clothing sports advertising, people are generally stupid. The premise is that natural selection has been neutralized by technology, so the human race de-evolves to the state in the movie. Kunstler is kind of doom-sayer in a lot of ways, but I really like that he puts these contrarian positions out there to ponder. His insights into modern architecture and urban development seem spot-on to me. I just hope he's not right. A public meeting will be held this Thursday, July 30^th at 7:00 pm at Northeast Library (2200 Central Avenue NE) to discuss the Central Avenue Bicycle Study. Several alternatives will be presented for the placement of bicycle lanes. Bicyclists are invited to share their opinions on the alternatives. If you cannot make the meeting, you can provide feedback using this online form. 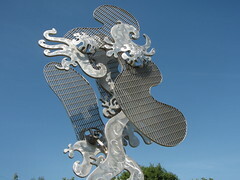 For more information please visit the project website. The Poetry of Sarah Palin! As I mentioned in the previous post, I am quite pleased with where I have gotten myself to re: commuting. My fears are now turning towards losing ground come winter. At present, the bike is the quickest, easiest way to work. Come winter, I doubt it will be either the quickest or the easiest. But I still want to give it a go, partly because I am in decent shape (for me) right now and don't want to lose that, and partly because I know it can be done. The Dark and The Cold can be remedied with money and money/trial-and-error (respectively). The (lack of) Motivation is a little more difficult to control. Still, recognizing this is a good step for now. I added some fenders my used Marin mountain bike this weekend and re-purposed a spare cargo rack to that bike with an eye towards making that the winter/ugly weather bike. I am currently researching some light options as well. The light I currently have is good for getting caught out after dark, but being afraid of the dark, it doesn't seem quite like what I want to face winter with. There are a number of ways I could go and it's more about price point than anything else, it seems. The motivation work comes from writing this all down and putting it out there as a dare to myself. Maybe it was the ultra-bad transit experience in the rain on Tuesday, maybe it's the additive miles, or maybe it's just familiarity that comes with repeated effort, but for whatever the reason, I feel like I passed through a threshold of some sort this week. For the first time, I feel like riding the bike is the fastest and easiest way to and from the office. Getting here was part of my motivation for turning in my parking pass in March. My goal was to make riding the easy option, and now (finally) it seems like I made that goal. I have no trouble with the distance, my speed is good (at least good enough for me) and I have the packing/changing routine down cold. Partly it's experience, but partly it's gear. One of my goals for this cycling season was to make biking an after thought; no need to think about it or dress for it. I have accordingly moved from traditional bike shorts to either knickers (rock climbing pants, specifically) or baggy nylon shorts over boxer briefs. This is a great combo, and for the distance of my commute more than adequate. In fact, I have dressed like this on longer rides with no... ill effects whatsoever. I also scored a pair of Keen SPD sandals this year, and that's been a very nice addition. Make the ride attire much more street friendly and the Keen's are the most comfortable bike specific shoes I've ever had. We'll see what happens when the weather turns cold and days get short. I am generally afraid of riding Park/Portland in winter - the streets narrow and the speeds don't decrease, and the thought of getting hit from behind does not appeal to me at all. Chicago Ave. might be an option, but I am also a little concerned about the cold and the wet. One step at a time, though. The perennial shade garden seems to be doing well this year. We lost a nice Bleeding heart over the winter, which caused the big bare spot in the back of the perennial bed, and another ivy that put in last fall to reinforce my fading ivy. Now that I think about it, we also lost a very old honeysuckle vine as well. That's gardening. I was too late to replace the Bleeding heart this year; they cook down pretty quickly in summer and the garden shops did not have any left by the time I got around to trying to replace it. I did transplant a small volunteer ivy last night (rescued from my side of the neighbor's retaining wall), so I will try and nurture that into something before the freeze hits and reinforce my anemic Boston ivy. As for the honeysuckle vine, Minnihaha garden center did not have any of those, either. I went with a trumpet vine instead. Those can be a little aggressive, but they are good for humming birds, so I felt I was willing to deal with the aggressiveness and see if I can get some hummers. If it's too much to deal with and swallows my garage, I'll just pull it out and go for Wisteria or something. Our yard is very "mature" and the only real gardening space is pretty much dry shade. Despite that little challenge, I am pretty pleased with what we have done with it. A co-worker and I were trading weekend stories this morning at the office. He told me that he rode a portion of what sounds like the LRT trail out in Eden Prairie or Chaska this weekend. At one point on the ride, they stopped at an overlook of a pond and entered a blind or shelter with port holes to view the water. After peering through the portal for a bit, he felt a sensation of bugs crawling on him. He noticed a swallow nest right above him. Thinking nothing more of it, he saddled up and rode on, stopping several times to brush the invisible creepy-crawlers off of him, but he never saw anything to cause the crawling sensation. Thinking about it while riding back to MPLS, he concluded that mites or other vermin from the baby birds dropped down on him while he was in the shelter. He told me that when he got home, took a long hot shower and finally felt better - no more crawling. That was, until Sunday, when he again put on his helmet and had the same creepy crawler sensation. The bugs must have lodged in his helmet as well, and he was now re-infested. Luckily, they had some "lice-be-gone" spray at hand from work at the local school, so he doused the helmet with the bugicide, washed it well, and let it dry. All was well on the ride in to the office today. The Three River's Park District's new Dakota Regional Trail is very nice. I rode it this afternoon with a co-worker and his family after getting curious about it from a group ride I was invited to but unable to ride. We found the trailhead near Shaver Park after some searching just west of downtown Wayzata (Wayzata is a real trip, by the way; it's the like "The Truman Show" in real life). There is not much parking for the trail, and at this point the trailhead is not well marked. There is a city beach and a small marina associated with Shaver park, but the vast majority of the parking spaces are permit-only for the locals. There are a few parking spaces for trail users, but it's really very few. We ended up parking in an office building parking lot near the trail head along with about 25 others. The trail itself is very nice; many views of Lake Minnetonka, including one bridge (the Arcola bridge) that offers a good view of Big Island. Yes, the weather was perfect today, but I was amazed at the number of people using this trail. My wife told me that she read that this part of the metro was very low on bike/walk trails, and after seeing the traffic today, I believe there was unmet demand in this area. The trail is only 13.5 miles long, but it's a good 13.5. Near the end of the trail is Big Stone Mini-Golf and Sculpture Garden. This is worth the ride alone - fantastic sculptures; very creative and well done. I was particularly impressed with the size and cost of the materials. Tons of granite and stainless steel went into these pieces. We didn't golf, but walking around the sculptures was enough of a treat. The Luce Line trail comes through Wayzata just north of Shaver park, so it would be easy to ride the Luce Line from MPLS out to the Dakota and then pick up the Dakota that way if you are not a drive-to-the-ride type person. Last week I was talking with someone about blogs. It turns out he was a connoisseur; he told me that he absolutely hated blogs that were simply about what someone did yesterday. I agree wholeheartedly! If a blog is going to be worthwhile, it should be consistently thought-provoking, insightful, topical and humorous. (No, that SUV in the photo did not jump the curb and kill us all, although it seems like might). We rode our bikes for awhile and then we stopped and had breakfast at this place. It was nice. Later, I baked a pie with some rhubarb that a guy on the bike ride gave me. It was fun. When does a simple bike repair turn into a arrest? When the bike is a $5,000 dream machine and the "owner" doesn't know how to inflate a Presta valved tube. The mechanics apparently made a phone call, did a sloooooow repair and waited for The City's Finest to show up and ask a few questions. Apparently he was trying to pawn this bike over at Lake and Pleasant earlier and was seen there as well. Thanks, MacGyver for posting these photos! I got charmed into participating in the Bike Force/Minneapolis Institute of Arts event this evening. Several co-workers were interested in going, and I was on the fence, so this was enough to tip me to the "yes" side of the equation. We met at One on One for a free beer (thank you, Surly) and generally made the scene, then rolled out for Critical Mass-style ride around the riverfront and downtown to the MIA. The ride was a trip; I have never done a Critical Mass ride (I am generally opposed to CM and don't think it does bike commuters, let alone other cyclists, any favors). Mob mentality took hold, however, and I ran the lights and waved at the honking cars with the rest of these miscreants. We made it to MIA with no accidents, arrests or pregnancies (as far as I know) and hung out at the MIA for awhile before splitting. I ran into half a dozen friends but missed a few others I had hoped to see. My co-workers really enjoyed the event, and I had a good time as well. Of course, bicyclists are like everyone else; they establish subcultures and cliques just as other groups do. There's a broad spectrum of groups ranging from the carbon-fiber-vs.-titanium-color-coordinated roadie group (who will turn their noses down at a very nice steel bike) to the cultivated informality of the bikes-anarchists. And there's everything imaginable in between. "Poser" (or more frequently, "Poseur") is a term used on Bike Forums to describe people with fancy road bikes that only ride them to the coffee shop and hang out in their cycling clothes to be seen. I am coming to the position that a Poseur just might be anyone who's into bikes for the look and the scene, regardless of what that look is and what bike is considered to be hot. It should be about the ride, shouldn't it? I think that at some level, that's what most people want when they start riding a bike (remember swooping down a hill and then getting back up it under your own power, going fast around a corner, or getting just a little better each ride...). Seems like a lot of people seem to get blown off of that course and end up convinced that whatever eddy current of bike culture they end up swirling around becomes the experience of being a biker. My advice: don't settle for the common denominator or the easy answer just because it's in front of you. Make up you own mind about what's good and what's worth spending your time on. There is a ton of stuff going on this weekend. Bike Film Festival, BFF bike polo tourney, a fund raiser pancake feed at Bedlam theatre for Bike! Bike! and the Tour De France live on the big screen of the Riverview Theatre. Plus, MMRB is looking for help to push some bikes out this weekend. 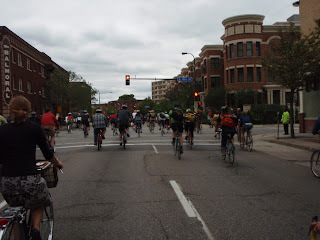 The TDF conflicts with the Hiawatha ride, which I am wanting to do again, but I'll opt for the TDF this weekend and pick up the Hiawatha ride next week, hopefully. I'm also planning on spending Saturday afternoon wrenching for MMRB and hitting the pancake soiree at Bedlam. I may or may not make the scene at the BFF polo tourney, helping out but not playing. The TDF has taken a toll on my discretionary time as usual. It's a grueling test of stamina to try and watch every stage, let alone ride the thing. Thankfully I am recording it and can skip the commercials, but still, it's too much tv time in July. In other news, it's been almost a week since Palin gave her resignation announcement. There is a lot of speculation on why she did it, since she really did not give a clear answer in her interview/press conference. One theory is there is a major scandal coming down and she resigned to avert that disaster. Another popular theory is that she is positioning for a run for President. I can see that, but I don't see how dropping the ball and walking off the court helps her do that. Personally, I subscribe to a simpler explanation; I think she needs to do this to cash in on her book deal and hit the speaking circuit while she is still a hot commodity. You've got to make hay when the sun shines, as they say. It's left Alaska perplexed, and raises all kinds of questions, but that's pretty much status quo in Alaska. I thought I knew what I was doing with bike fitting after all this time, but today I learned that I have more to learn. 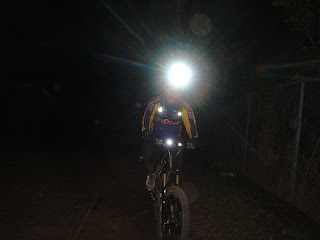 Last Thursday night I brought the Rawland in the house for a thorough once-over. I've done some minor new-bike adjustments to it to solve ghost-shifting problems and stretched brake cables, but it was sorely in need of a cleaning and de-grease/re-lube after a few months of commuting without much TLC at all. I cleaned the chain, took the wheels off and trued them up a bit, cleaned the frame up some, added a second bottle cage and moved the pump to the underside of the down tube (cool - I like that) and generally gave it good going over. As I stood back to admire my work, I noticed the seat was all the way back in the seat post. I thought that was a little radical and could not recall what I was thinking when I set that up, so I moved it forward a bit. I have been bothered with a little tightness high in my calf, just immediately below my knee joint, and had a general feeling of weakness or instability in my knee as well. I was zeroing in saddle position as the cause, and after critically looking at my saddle/seat post orientation, I decided to make the saddle fore/aft adjustment and see. A slow and easy ride to Hopkins today confirmed that this was just the ticket. The seat forward position eased my knees issues, but then my seat felt a little too high; so I dropped that about 0.33" or so as well. Of course, that felt too low at first, but after the 20-something miles out and back, I am pretty sure this was just what I needed to do. The irony for me is that just last week at a focus group I participated in, I made the statement that most novices have their seat too high because it feels better; more like walking. I guess I can toss myself into the "novice" group at this point. Anyway, I am glad I figured this out and we'll see how this week's commutes confirm or contradict today's recreational ride findings. A big "thank you" to Ron White, Chairman of the Midwestern Tool Collectors Association's "What is it" Committee for his reply to an email I sent him last week based on a comment I received. He was able to solve the mystery of what the heck this thing is in one sentence or less. 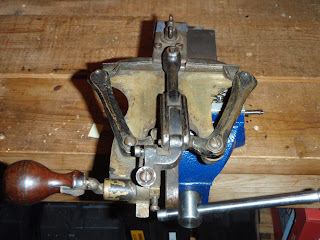 Ron tells me that this is a Cunningham Saw Set, and was used to set teeth on band saws. The unit was manufactured in Worcester, MA in the late 1800's. This tool sold for about $7.00 in 1895. It went for $3.00 in a garage sale in Phillips a month ago. Pretty cool, but although I now know what it is, I need to study up on how it works. We took a few days off to go to northeast Iowa over the 4th of July weekend. I was very favorably impressed with northeast Iowa; the landscape is beautiful and the local archaeology is very interesting and well documented. 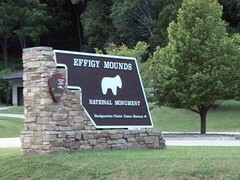 We did Effigy Mounds National Monument first off, hiking all the to the Marching Bears and back on Friday morning. The mound groups were very interesting; I have always been interested in mounds after living near one in Madison for a year, so this was a good chance to see some more and learn quite a bit about the mound builders (or at least what we think we know about them). Interestingly, Iowa has beautiful roadways. They have an abundance of wildflowers growing in the roadsides and ditches. Crossing the border back into Minnesota, all the pretty went away. We think it's due largely to the fact the Minnesota makes a point of mowing the ditches religiously. I have never been a fan of ditch-mowing due to wildlife impacts, but I can see now I never appreciated the vegetation impact as well. We took the scenic way back, rounding the west shore of Lake Pepin with over 100 Baby Boomers on Motorcycles (BBMs). We have a hard time not shaking our head at all the BBMs out there. The generation that will never get old, is in fact, getting old. I saw at least 10 motorcycle tricycles bombing along on this trip. If the BBMs are truly Born to be Wild and want to stay young, they should trade in the Harleys and Goldwings for a bicycle, I think. Freedom Isn't Free - Happy July 4! Happy July 4 weekend, everyone. Be safe, have fun, and take a stand against communism or free trade or something important like that. Go for a ride while you do that. I did a brisk road ride this afternoon for the first time this year. 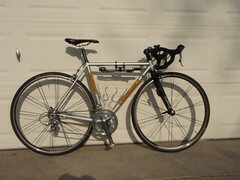 Most of my 2009 riding has been regular commuting to work on the Rawland. I can tell that the elapsed time on the bike from commuting has been good for me even if it's not racking up huge miles (in fact I fit into a pair of pants today that were a little too snug previously). It was good, though. I had enough base miles in my legs to make the hills of Medina no problem and sustained nice high speeds (for me) for the whole ride. We averaged 15.5 mph, which I'll take, considering we toodled around the perimeter of Baker park reserve on the trails, and that plus the hills will drops the average a bit. The best part was that my riding partner and I were very evenly matched (except for the fact that he was on a 60+ cm frame and I was on my 50 cm). We probably looked like Abbot and Costello out there. I was reminded how much I like that LeMond Sarthe. It's lively, out does me in a climb, and it's very steady despite it's steep angles. We touched 32 mph on one decent it seemed to be on rails.